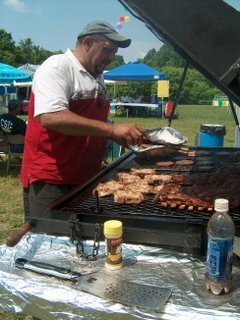 I always love to talk to barbecue chefs, and it was great fun hooking up with Dennis Correll at the town festival. He was loading ribs, burgers, and pork chops on a custom industrial cooker out of South Carolina. Now, that's a grill I can tell you. Would have made me drool even if it hadn't been covered with meat. The Corrells don't barbeque full-time, but they do hit the festival circuit from time to time and also are glad to cater for parties. The young lady handling the french fries said they had a party for 200 coming up soon. Wish I had an invitation to that. Mobile Conessions is based out of Salisbury, NC. The owner is George Correll. If you live anywhere near the area and need to feed a big crowd, give him a call at 704-636-5430. I had the ribs. They are huge slabs and Dennis gets them done to perfection--tender and smoky. They sauce them up with a tomato based mix that is mild. 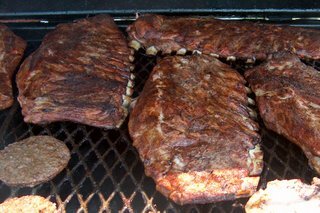 Some of the die-hard BBQ folks spice ribs up big times, but when you're looking at feeding a group with a range of taste buds, these will be perfect. Just hand the "hot" lovers a bottle of tobasco sauce. I'd also note the slaw. It was a nice southern cabbage mix with tomato chunks. I'm not a super big fan of cole slaw, but this was very tasty. Where is your SPECIAL barbecue spot? Grilled Cheese Potatoes - NO - I don't think so. Something fishy to think about.